A NOTE ABOUT OUR CIGARS: We have lovingly developed our own line of premium hand rolled cigars that transmit the beauty of our Catholic Faith. In consultation with and getting input from over 10 faithful priests, we have produced perhaps one of the most unique evangelization tools you've ever seen. The cigar bands are themed after the 5 Marian Dogmas, St. Joseph, the Holy Family, Sts. Joachim & Anne & in honor of Traditional Marriage. 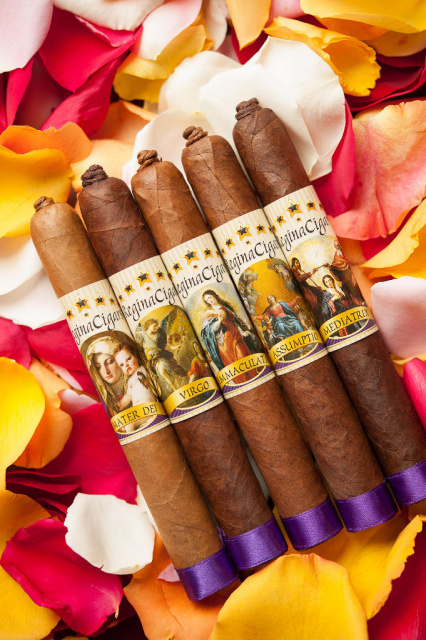 Not only are these some of the finest quality hand crafted cigars on the market, the bands act as a beautiful means of evangelization since on the inside of each cigar band there is a prayer, quote from a saint, or some ancient Marian hymn that corresponds to the artwork on the front of the bands. In this unusual but tastefully done project, we are attempting to follow Pope Francis' mandate to evangelize out to the margins by reaching folks in a fresh & unexpected way. This new effort is not about using our Faith to sell cigars, but using cigars to sell our Faith! Click HERE to learn more and see how beautifully crafted these cigars are...they make a perfect gift for Father's Day, Birthdays, Anniversaries, Ordination Celebrations, Wedding Receptions, Groomsmen's Gifts, Easter or Christmas...and a portion of the proceeds goes to help persecuted Christians around the world. Cigars are completely different from cigarettes; cigars are completely organic with no manipulated nicotine levels or toxic filler additives. Cigar smoke isn't inhaled & they are typically enjoyed in moderation on special occasions...more of a hobby than a habit! Recently Pope Francis banned Vatican stores from selling cigarettes but still allowed cigars to be sold since they are not something that is inhaled.